We all love it when Finn chooses. Choosing makes Finn an active character, and that’s good for his arc. He began the show in a somewhat powerless position: his girlfriend was demanding and often belittling of him, and his teacher blackmailed him into joining a club. His girlfriend cheated on him and got pregnant, and lied to him. Most of Finn’s original storyline had to do with things happening to him, making him a passive character. So think about when Finn is most likeable: when he’s being active. When he’s standing up for things, and trying his hardest - making forward decisions, and fighting for what he wants. I loved him when he worked hard at being a good boyfriend and future father. I loved him when he chose to be the bigger person and return to Glee for “Sectionals.” I loved him when he chose to actively pursue Rachel at the end of “Hell-O.” In Season 2, he’s been the most compelling in “Rocky Horror Glee Show,” where he actively (and adorably) professed his love for Rachel in “Dammit, Janet,” and chose to confront his fear of being in his underwear onstage by walking down the hall in his skivvies. Finn truly shines as a character when he’s not just letting things happen to him, but rather actively participating in his life. When he chooses. Because remember? Finn choosing kicked off the whole show. But what becomes problematic here are the choices that the writers select for Finn to make. It’s compelling when he makes decisions that forward the storyline or his character arc. All of the above examples? Good, interesting, productive decisions. But the writers seem to be going back to the same choice: between Glee Club and football. Why are they unable to find any other sort of conflict for Finn to deal with? Yes, the character represents both Popularity as well as Glee, but does he really have to choose between them every other episode? The fact of the matter is that Finn chose in the Pilot, and should not be having to re-choose over and over again - and he should certainly not be choosing the opposite of his original choice only to realize he did the wrong thing and backtrack. In this regard, Finn is stuck on what I’ve come to call the “Glee Character Carousel.” Instead of progressing his arc forward, he just goes around and around. Although, at least he’s on the ride - poor Tina is still waiting in the damn queue. Regardless, this does not excuse the poor development of Finn’s character. And what makes this kind of a moot point is the fact that Finn shouldn’t be forced to repeatedly choose his priorities between Glee and football anyways. When Kurt and Mercedes joined the Cheerios, they expressed very clearly that it was possible to do both, even though Mr. Schuester saw their actions as some huge betrayal. But Kurt and Mercedes were right. The message should be that you can play football if you want to play football, and you can sing in Glee Club if you want to sing in Glee Club. You can do both. You have every right to do both. And remember the first character to teach us that? Yeah, that was Finn, in “Mash-Up.” Did he un-learn that or something? Honestly. For whatever reason, the writers insist on repeatedly presenting Finn with the choice between Glee and football, and inevitably the pattern is this: he panics and chooses popularity, and then realizes he goofed and tries to backtrack and pick Glee. I can understand that Finn would freak out and double back in the Pilot. I can even understand that he would do it again in “Mash-Up.” But after that? There should be no looking back at this. Finn made his choice. His choice defines the character, defines the show, even, and therefore it should be set in stone. It should not be erased at the start of every episode and penciled in again by the time the credits roll. What’s worse, Finn’s poor decision-making carries over into the general choosing between right and wrong. How many times has Finn made the wrong decision or done the wrong thing, only to have to amend it later? He stood Rachel up in “Mattress” at the slightest hint of bullying pressure. He chose to go on the date with Brittany and Santana in “Hell-O” instead of trying to make things right with Rachel. He lashes out at Kurt in “Theatricality” and has to atone for his actions by donning a red shower curtain. He doesn’t stand up to the football team in “Furt,” and has to make up for it with his best man toast. Remember earlier, I mentioned the “Finn-does-something-douchey-and-out-of-character-and-then-eats-humble-pie-until-the-next-time-he-does-something-douchey-and-out-of-character” scenario? Well, here it is. I won’t speak for everyone, but I personally detest it. Because look at the people negatively affected by Finn’s poor decision making: Rachel, and Kurt, the character embodiments of Glee, or just the Glee Club itself. 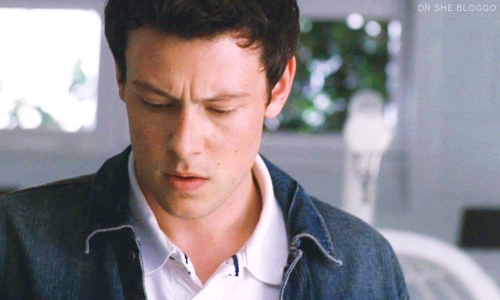 When Finn chooses against them, he is fighting the feeling, and it is established in the VERY FIRST EPISODE that Finn cannot, and will not, fight the feeling anymore. I think the writers believe that Finn’s inability to choose properly makes him likeable, or relatable, but the fact of the matter is that this makes him frustrating. He becomes the character that can’t learn from his mistakes, and the character that takes too much time to realize he needs to stand up for what’s right - and after awhile, it’s hard to make excuses for that. Especially when he’s supposed to be the character that embodies the joy of self-discovery, who tries to be a leader and do the right thing. It just goes against everything the character stands for. Alas, Finn is stuck in a revolving door of conflict, and the more rotations he makes, the more the audience is worn down to the storytelling devices. I know that I frequently harp on the importance of characters who choose, but with Finn, the writers have gone too far. When he made the first choice, it was compelling. But now it’s worn thin. There is far more rewarding material that can be given to the character, even though his decision happened early in the show. Cory's acting skills deserve it. Finn can make other choices - good choices. And there can still be progress, that develops and stays true to the original intent of the character. There's a great quote from Farscape that I think fits this. John: Do what? Do the right thing? John: Rygel, I figure the right thing starts at the beginning of the day. Not after you've been caught.